As promised in the podcast, here is a link to the Cornell paper on the greenhouse gas effects of methane, and below is chart on the annual particulate emissions for typical residential heating appliances. If you would like to add your voice to the dialog please comment, we would love to hear from you! Erica: The January 2019 edition of the Brave Little State podcast on VPR posed the question “what are the pros and cons of heating with wood?” I’m Erica Dana and I’m here with Jeff Rubin, Executive Director at Sustainable Heating Outreach and Education, a nonprofit group that advocates for clean heat. Jeff, the podcast posed a simple question that seemed to get pretty complicated pretty quickly. What was your overall impression? Jeff: The producers did a great job of bringing together disparate voices. I heard many of the same things that I bring to my audiences, as well as a few of the standard objections I hear quite a lot. Heating IS complicated. Every home is different. For the most part, people are stuck with the heating system that they have, and no one teaches heating science in school. Erica: Yes, it seems like people are looking for answers and really want to do the right thing. As someone whose organization is dedicated to reducing climate change from heating pollution, do you think the producers got the pros and the cons right? Jeff: The forest preservation piece and the local economic benefit of heating with wood is kind of a no-brainer so, yes, they absolutely got that right. The more difficult conversation is about the environmental impacts. I’d love it if we could provide a simple, uniform answer, but we can’t really talk about wood heating unless we put it in the context of all our heating options. The team’s investigative reporter, Emily, makes the point that there are definitely environmental costs to heating with wood. That’s absolutely true, but the larger point is that there are environmental costs to HEATING. Full stop. 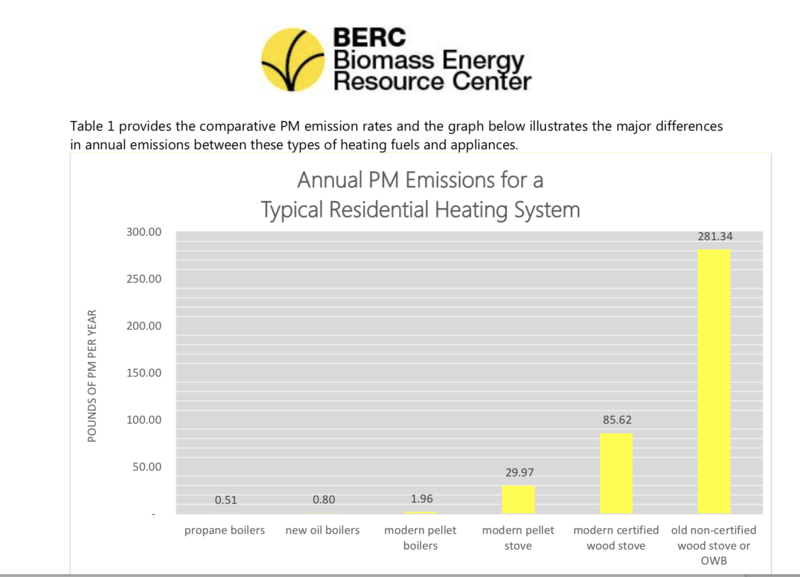 The important context lies in the COMPARISON of our heating fuel options (which are not unlimited), the kind of building we’re heating (and, specifically, the heat loss profile of the building), and the practicality and affordability of the options that move us closer to clean heating. Erica: That’s a lot to comprehend all at once. Can we simplify it a bit? Jeff: Unfortunately, none of this fits on a bumper sticker, but yes, let’s deal with just the environmental impacts of the comparative heating choices. Erica: One of the most compelling parts of the podcast was the family who lives near the wood chip plant at Goddard College. Do you think she was right? Jeff: Definitely. Living so close to a heating plant when your husband has lung disease has got to be unbearably stressful. I can empathize with their decision to take out their wood stove. There is so much alarming information on the internet for anyone who wants to go down that rabbit hole. The difficult comparison you’d want to make in that instance is comparing the health costs of living next to a plant that’s heating 21 buildings with wood chips (which are a known irritant) against burning 65,000 gallons of fuel oil (a known carcinogen). Erica: Yikes! Irritant versus carcinogen. Not a great choice. Jeff: There is no such thing as a free lunch. One way or another, we’re all going to heat our buildings. And one way or another, there’s going to be a cost. Erica: So, how do we get a handle on that? How do we measure the comparative costs? Jeff: I don’t know of any exact scientific answer to that question, but I think we can begin to get our minds around the problem by breaking it into two parts: climate impacts from CO2 emissions and health impacts from particulates. You know oil and gas have particulate emissions, too, and they’re not all that different from wood fuel in a high-performance appliance. I’m going to include a chart that compares particulate emissions, on the web-page where we post this podcast. Let me describe it to you. The picture that we have in our minds of a dirty, sooty, pre-1990s woodstove is pretty out of date. Modern wood stoves are cleaner by a factor of 3. And a Modern pellet stove is cleaner by a factor of 9. Think about that… We’ve achieved 9 times less particulates just in the last decade. But that’s still nothing compared to a modern pellet boiler… a modern pellet boiler is fully 140 times cleaner than that old wood stove. 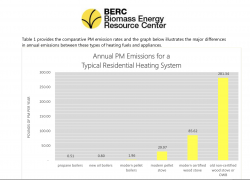 So, let’s make sure we’re keeping it real when we talk about particulate emissions… the entire deviation between propane, oil, and a pellet boiler is less than a pound and a half. So there’s really not much difference in particulate emissions between the three combustion central heating fuels. As the director of an organization whose central mission is focused on mitigating climate change, the greater question for me has to be the greenhouse gas impacts of our heating fuel choices. And here I think the choices are simpler than the podcast suggests. Now this is gonna sound a little sciency but the concepts are really simple. We need to compare geologic carbon with biogenic carbon. Geologic carbon has been sequestered in the earth for millions of years. If we burn it, we’re adding to the total carbon in the atmosphere. Adding geologic carbon to the natural carbon in the Earth’s atmosphere is how we got in this mess in the first place. We need to leave that stuff in the ground, period. Biogenic carbon, on the other hand, is part of the Earth’s natural cycle. Think of a tree as a solar battery. As the tree grows, sunlight, rainfall, and carbon dioxide absorbed from the atmosphere combine to store the sun’s energy. When a tree dies, it releases the same amount of carbon that it absorbed while it was growing. But if it just rots slowly on the forest floor, we don’t get the benefit of that energy. Jeff: So there are two answers to that. First of all, the data that I have is a little different from the data presented by the Dartmouth professor in the podcast. His point is that it would take 60-100 years to replace the carbon from the tree that we just used to heat our home. If you look on the sustainable forestry page of sustainableheating.org, you’ll see data that a tree absorbs most of its carbon in the first 35 years of its life. So, it’s true that using wood for heat is “fast out” and “slow in”, but perhaps not as slow in as the podcast suggestions. The larger point is: what are the alternatives? When it comes to fueling the 53 million central heating systems currently burning oil (many of which are now being converted to gas), we only have three options: oil, gas, and wood. Oil is the worst for the environment, and natural gas is not really the clean, bridge fuel that the big energy companies have been promoting. If you only focus on carbon dioxide, natural gas is pretty clean, but natural gas emits a crazy amount of methane and methane is 100 times more active as a greenhouse gas than carbon dioxide. The total greenhouse effects of natural gas are as bad as coal. I’ll leave a link to a scientific paper from Cornell on the podcast blog page for anyone who wants to dig into this a little deeper. Erica: It sounds like, between the three heating fuels, wood is the best choice in a lot of cases. I really like the point the podcast made about how wood heat is local heat and how it creates a market for waste wood from logging operations. That serves forest quality and incentivizes working forests, which helps protect them from development. Jeff: And it incentivizes green jobs and keeps millions of dollars in our regional economy instead of feeding Big Oil. Erica: Definitely! Is there anything you’d like to add? Erica: Yes, there seems to be a lot of green energy talk about solar heating and heat pumps. Isn’t electricity the cleanest of all the heating fuels? Jeff: That depends on where your electricity comes from. If you’re getting it from your solar panels, fantastic! If you’re pulling your electricity from the grid, it depends on the fuel mix of your electric utility. If your utility buys its electricity from a coal plant, then you’re heating with coal. Washington Electric Coop in Central Vermont, on the other hand, has a fuel mix that is 100% renewable, so, by all means, heat with electricity if you’ve got the budget for that. Personally, I’m with Green Mountain Power (who I think are excellent). Their fuel mix includes quite a bit of hydro (which is renewable) along with other renewables like solar and wind. But half of the fuel mix for Green Mountain Power comes from natural gas, which, as we already covered, is as bad for the environment as coal. Erica: Everything’s a research project! I guess if we want to heat clean, part of the process would be Googling the fuel mix of our local electric utility? Jeff: Yeah, it’s a pretty complex landscape when it comes to our healing choices. That’s why on the sustainableheating.org, we have a consumer help desk that’s available to work through some of these questions with homeowners. Erica: Nice plug! And that sounds like a good place to wrap it up. This is Erica Dana and we have been chatting with Jeff Rubin, the executive director of Sustainable Heating Outreach and Education. Thanks for listening and please feel free to leave comments and questions; we’d love to hear from you.